This is a condition in which a person keeps bringing up food from the stomach into the mouth and (regurgitate) re-chewing the food. Rumination disorder is commonly observed in infants but may also be seen in older individuals with mental retardation. Rumination disorder is sometimes called as Merycism. • Neglect of or an abnormal relationship between the child and the mother may cause the child to engage in self-comfort. The act of chewing is comforting for some children. Infants may also make unusual movements that are typical of this disorder such as straining and arching the back, holding the head back, tightening abdominal muscles and making sucking movements with the mouth. 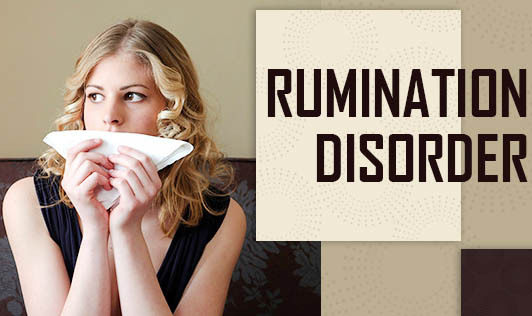 The symptoms must go on for at least 1 month to fit the definition of rumination disorder. If you notice your infant repeatedly vomiting, spitting or re-chewing food, contact your doctor!